Hold up- how is it November already? These last few weeks have been a whirlwind and I’m over here in Kentucky working hard to keep up. Fall is my favorite time of year and even though I haven’t gotten to enjoy any real sweater weather yet, I’m loving the beauty and new life that come along with the changing seasons. This past month I’ve gotten the chance to meet so many humans (I freaking LOVE humans, you guys) and what a privilege it is to get a glimpse into all these charming, intricate, and varied lives. It’s the coolest thing. I’m visiting our Gamma Xi Chapter at Murray State University this weekend, and I’m charmed by the sweet, Southern small town feel of this place. Everyone knows everyone and will go out of their way to make this suitcase-carrying stranger feel at home. Not to mention the women of Gamma Xi are SO much fun. I’ve gotten to go to a fall festival, hold three different puppies, and do quite a bit of exploring on campus. The chapter has their annual fall lip-sync battle, “Rockathon,” this Friday and I will be cheering them on from Kansas and probably trying to figure out a way to FaceTime in. Can I participate over the phone? Just another touristy photo of Sarah on a college campus. Hello, Murray State University! This was my view of campus during a sunrise run on Friday. Safe to say I understand the appeal of this place. But before I get ahead of myself here, I WAS IN TENNESSEE LAST WEEK! This was my first real chunk of time back in Nashville since I moved away in June, and it was exactly what I needed after months of hotel beds and rental cars. Nashville may not be my home anymore but it will always hold a very large piece of my heart and some of the most special people I know. Plus I find something new to love about the city every single time I visit. 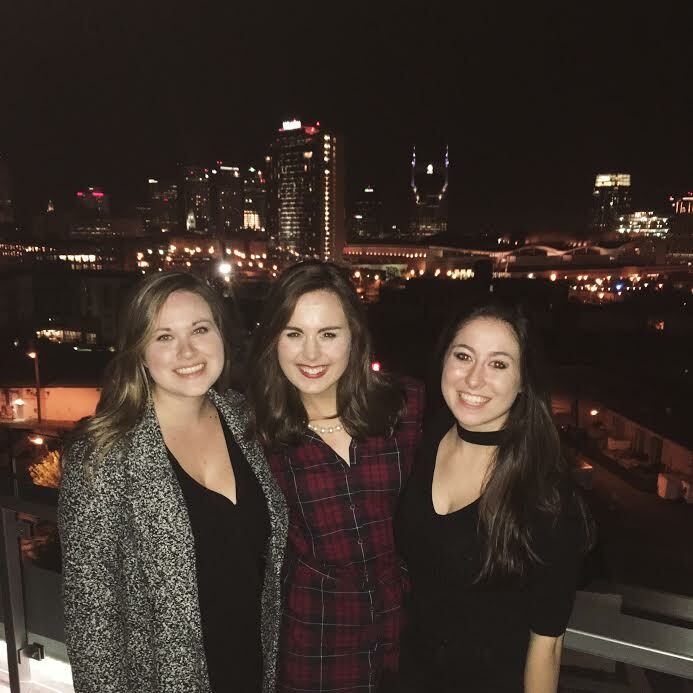 Mary and Miranda (two of those people I couldn’t survive this crazy year without) took time out of their work week to grab dinner with me at Up Rooftop Lounge in the Gulch, a hidden gem on the roof of the Fairfield Inn & Suites (who would’ve guessed?) that provides a stunning view of the Nashville skyline. Safe to say my enthusiasm was at an all-time high. I could write a novel about how much I love these friends. Thank you for making hundreds of miles of distance feel like nothing! The first trick to the perfect fall applesauce is the ratio of green to red apples. 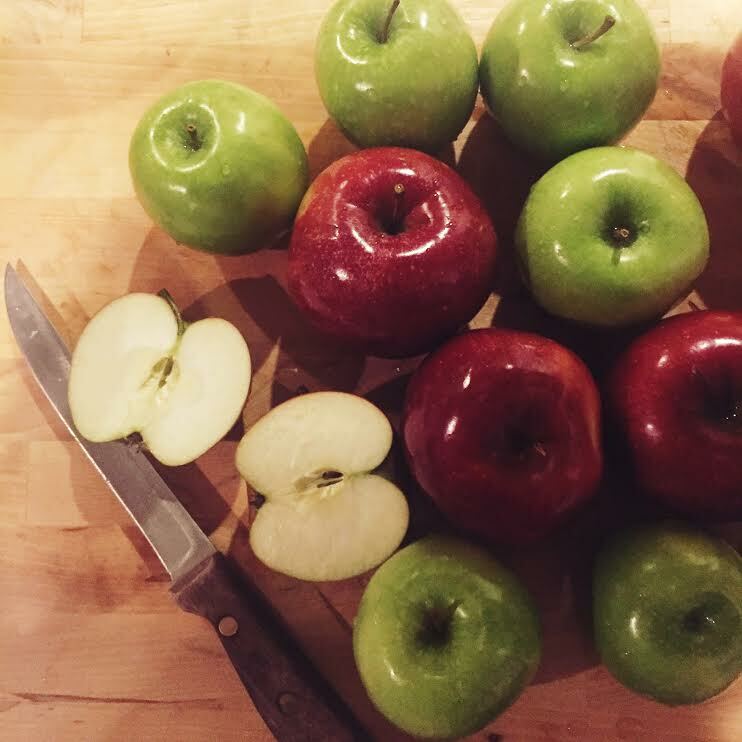 We use half Granny Smith to keep the final product from being too sweet, and the other half can be your favorite type of red apples. We cut them all up, blend them (skins and all!) and add some other type of special ingredient each year to change up the flavor. This year’s choice: blueberries and pears. Once the mixture is blended, place it in a giant pot over medium heat until it starts to bubble. Then add spices to taste–we use cinnamon, nutmeg, allspice, and cloves followed by a generous spoonful of honey. Turn the mixture down to low, let it cook for a couple of hours, and you have the most comforting autumn treat to eat for breakfast, lunch, and dinner. (Oops.) Did I mention it makes the house smell like cinnamon apple heaven? Let’s sign my dad up for Top Chef already. 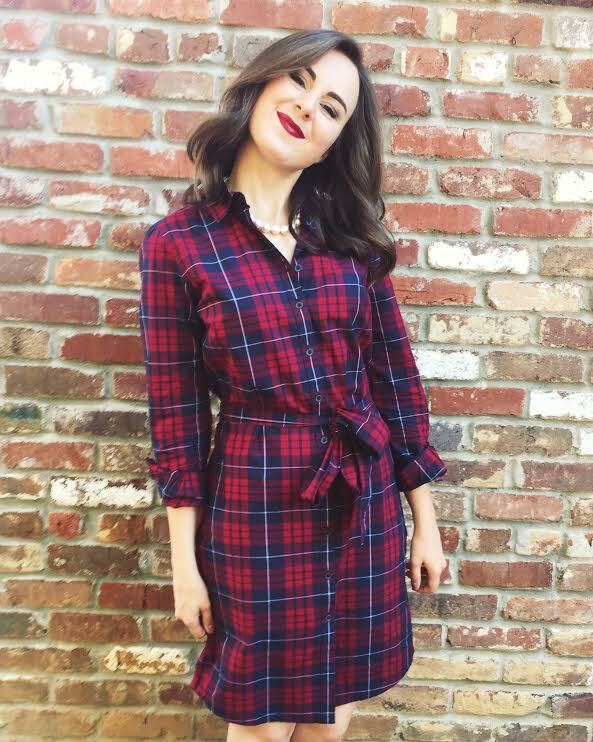 This navy and red plaid shirtdress from Brooks Brothers. Most of my October visits were in the South with weather in the 80’s, so this dress is my sneaky way of dressing for fall without dying of heatstroke. The NYC marathon! It happened this morning and I was absolutely dying to be there. I have been slacking on my running lately and this has me motivated to start training for that 3:13 marathon qualifying time. Guys, I’ve got a long way to go. Yikes. Speaking of New York, I’M GOING NEXT MONTH! Emily and I are taking a girls’ trip and I’m so full of ideas and excitement I may not even make it to Christmastime. 38 days…who’s counting? Kid President. If you ever need a reminder that you can make it through this week, or even just this day, he’s got you covered. Go do something awesome.